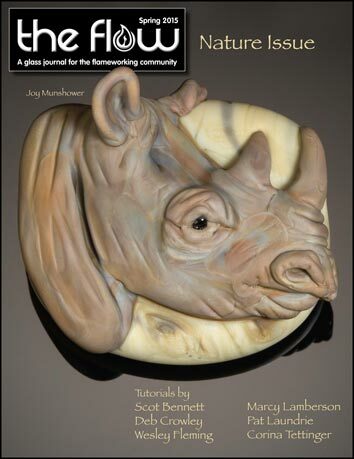 Jennifer Menzies, editor of The Flow, welcomes the spring and introduces readers to the multitude of nature-related articles and tutorials in this issue. She also reminds those attending the 2015 Glass Craft & Bead Expo to start practicing for the annual glass cutting contest. The Flow’s 2015 Spring Nature Gallery features the work of seventeen flameworking artists. These sculptural and jewelry pieces of glass art represent everything from nighttime ocean horizons, florals, mushrooms, trees, and florals to fish, birds, animals, insects, and shells. During the third week of September 2014, Pipe Classic 9 offered functional glass artists the opportunity to compete in The Bern Gallery’s annual flame off. Each year, twelve competitors are chosen by a committee of local artists and patrons. A record number of fans were there to cheer the competitors on. Flameworking artist Kim Fields shares her inspiration for making her lifelike glass bird sculptures. For this project, Kim included a green heron, created with realism from years of bird watching, a frog for his potential dinner, and their habitat filled with aquatic vegetation. Swirly glass was used for a watery base. World-renowned artists Junichi Kojima and David Willis brought their captivating processes and diverse work to the 2015 International Flameworking Conference. This annual event hosted by Salem Community College Glass Education Center celebrates excellence in flameworking with demonstrations, workshops, and featured artists. The turnout for the 2014 Glassroots Madison show was unparalleled, from contributing artists and exhibitors to regional and national buyers, as well as the public. Most of the 120 exhibitors from around the country had returned from previous years. The organization donated $15,000 to Second Harvest Food Bank from its sales. Kim Thomas, who currently creates under the name Zii, works with an impressive lot of folks. She has always been an artist, having a particular talent and interest in sculpture. Each work of art is birthed with the intent of inspiring thoughts and the realization that not all of life is pretty. Janice Peacock, an accomplished flameworking artist, has journeyed into the world of craft-based mystery writing, recently publishing her new book, High Strung, a Glass Bead Mystery. She feels that her writing actually adds to her creativity in glass artwork, which now includes large sand castings of her famous ancient mask beads. Sister publications The Flow, Glass Patterns Quarterly, and Glass Art are proud to join with the Glass Craft & Bead Expo to recognize up-and-coming artists through the Glass Craft Emerging Artist Award. Winners are chosen from artists who have work accepted into the annual juried art competition, Gallery of Excellence. 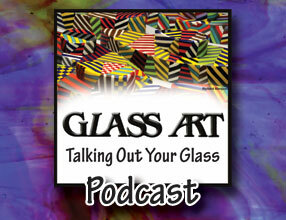 Information on the latest in new glass types and colors, supplies and tools, kilns, books, patterns, and anything else that glass artists and enthusiasts need for working in hot, warm, and cold glass can be found in the What’s Hot section of The Flow. Marcy Lamberson demonstrates creating jumping hare beads made from Dark Ivory glass. Before beginning the hare, an ivory bubble of glass is blown, rolled in silver leaf, and broken into shards to use as decoration for the hare’s body. Tips are included for ways to add character and realism to the hare. Deb Crowley and her son Pat Laundrie demonstrate how to create perfume bottles and stoppers. Once the bottle is completed by Pat, Deb fits the stopper bottom to the bottle, then fashions a decorative sculptural top featuring a sea turtle that is decorated with a dichroic pinwheel image. Readers share their thoughts on profiles, articles, and tutorials featured in recent issues of The Flow. Corina Tettinger, renowned bead artist and teacher, shares excerpts from her Daffodil Bead Tutorial: How to Make an Encased Daffodil Bead and Similar 3-D Flowers. Included are tips on finding inspiration, creating realistic glass flowers, and techniques for encasing the finished flowers with clear glass. Scot Bennett demonstrates techniques for electroforming organic matter, including animals, plants, insects, and reptiles. This process allows an electric current passed through a copper bath solution to deposit and build up copper onto the organic piece. The patinated subject can then be used to enhance a larger project. Wesley Fleming demonstrates how to create flameworked spiders using 104 COE glass. Techniques for adding interest to the spider by applying and raking glass stripes on the spider’s abdomen are included. The artist also offers tips for making realistic looking insect leg segments. Arnold Howard, who writes instruction manuals for Paragon Industries, L.P., discusses how observing kiln worked projects visually can help artists determine the correct firing temperatures and times for their particular kilns.